Best tip on sleeping with orthodontic headgear braces alongwith the best positions to sleep with braces and headgear on. 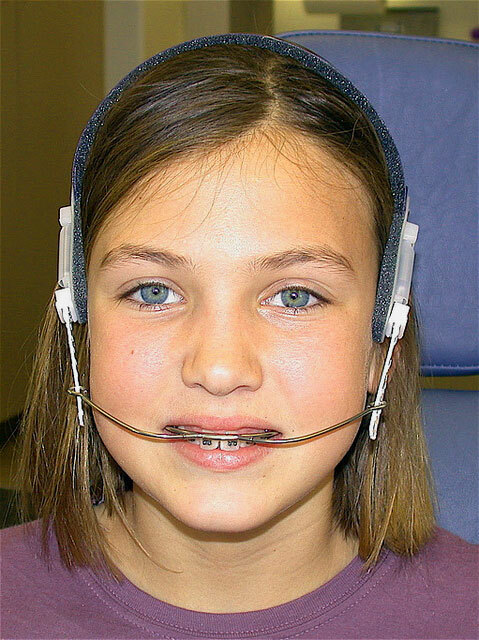 The issue of sleeping with a headgear for braces is one that most people with braces don’t really think about until they are in a position that forces them to. For some, it’s not a problem because they only get to wear their braces for a few hours a day and take them off when they get home. To an increasing majority, however, they have to put on and sleep with headgear braces at night when they go to sleep to avoid the stigma that is commonly associated with braces. While, on the surface, this might seem like it solves the major problem that teenagers try to avoid, that is, teasing from their mates, it however inadvertently creates a new one whereby the teen must now learn how to spend a night with their face surrounded by a metallic grid. To give you a more accurate description of a headgear, assuming this is your first time reading about it and you’ve been considering getting braces to move your teeth and guide the growth of your jaw – it is an appliance worn outside the mouth. It consists of three parts. The first part consists of bands cemented to the molars. The molars are the teeth located at the back of the mouth. The second part consists of a u-shaped wire. This wire attaches the bands to the headpiece. The third part, is, you guessed it, the headpiece. Trying to sleep with your head submerged in your pillow while wearing a headgear might prove to be very challenging, to say the least. Common sense spells out that this is the absolute worst position to try and get those much-needed zzz’s. Should you get inspired to try it out, the pain from the metal gear as it pushes your teeth to the side of your mouth will be decapitating. In a few minutes, your mouth will feel really sore. Stay too long and you might just be required to make an unplanned visit to your orthodontist the very next day or worse, to the emergency room to fix damaged blood vessels and tissues in your mouth. This is a much better position than laying on your chest. Your gear is not brushing against any part of your mouth threatening your safety. It’s also relatively easy to fall asleep since the pressure on the side of your head courtesy of the gear is relieved based on your angle. A word of caution, though, sleeping on the side for prolonged periods might cause your jaw to lose its perfect symmetry albeit it might not be easily noticeable. The reason is the pressure by the gear would fall on one side more heavily than the other causing the imbalance. Praised as the most comfortable position by the vast majority of headgear wearers, lying on your back does not have the shortcomings that the other positions do. For instance, in comparison to laying face first, the straps holding the headpiece do not dig into your sides too much. This makes it much more comfortable. There is also very little strain exerted on the teeth apart from the normal amount you would feel wearing the gear. Best of all, when compared to both aforementioned positions, the wearers can position themselves, while on their back, in a way that the headgear strap does not even come in contact with the pillow leading to absolutely zero strain on the head. If you’ve just gotten the headgear you need to ensure you get accustomed to the feel of it around your face, teeth, neck and head before you go to sleep. One effective way of doing this is “test-driving” it. Put it on while you watch T.V or while you perform some house chores. By the time you go to bed it will feel more natural. To make yourself comfortable with sleeping with headgear braces, try adjusting the straps and headpiece until you get that comfortable feeling. Just be careful not to tamper with the wire that straps around the teeth and holds them firmly. Search for a pillow that complements the headgear. Not all pillows are goof for sleeping with headgear braces. In the same way, there is more than one type of headgear. If you’re wearing the most common headgear- the face bow – that basically consists of a wire in the shape of a bow that stretches and attaches to the upper molars, an ordinary pillow will work just fine in most cases. If you’re wearing a J hook headpiece that is built to attach to your head and neck with the same head strap then consider getting a slightly denser pillow to prevent your neck from sinking and causing discomfort where the headgear strap attaches. Set aside time on a regular basis to clean the headgear. Sometimes the level of comfort depends on the hygienic state of the gear. Spare a few minutes every day to clean the gear using a mild-disinfectant. This will prevent any infections that might be caused by an unsanitized headgear ultimately elevating the comfort level. Schedule an appointment with your orthodontist as needed. Headgears are different. A headgear on one person might not last as long as on another person. Only an orthodontist can spot the weaknesses and repair them or provide a new headgear for you. Overall this will improve your comfort level. We hope that the above Tips on Sleeping with Headgear Braces will help you in getting the best out of your ortho-dental treatment. Whatever you do, remember to wear your headgear for at least ten hours straight. Dental progress can only be achieved when the device is worn for ten hours in a row.